Lawmakers reacted with partisan vigor this weekend after Interior Secretary Ryan Zinke announced his pending departure from the Trump administration, regarding his tenure at the agency as anything from "one of the great secretaries of Interior" to "a shameless handmaiden for the special interests." President Trump announced Saturday morning that Zinke will step down from his post this month, ending two years marked by a string of investigations surrounding spending and management at the Interior Department (Greenwire, Dec. 15). "After 30 years of public service, I cannot justify spending thousands of dollars defending myself and my family against false allegations. It is better for the President and Interior to focus on accomplishments rather than fictitious allegations," Zinke said in a statement Saturday. Deputy Interior Secretary David Bernhardt, a former lobbyist for oil, gas and water interests, will likely step in for Zinke until a permanent secretary is announced. The president tweeted Saturday, "The Trump Administration will be announcing the new Secretary of the Interior next week." 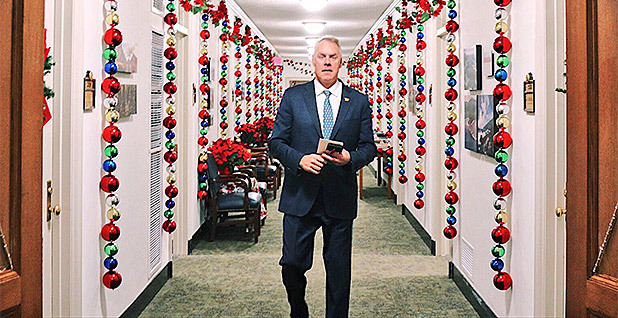 Zinke's former colleagues — he won election to two terms in the House before his nomination to Interior in early 2017 — lamented his exit from Trump's Cabinet but largely eschewed the issues that forced the 57-year-old to step down. "I was disappointed to learn that Secretary Zinke is stepping down. He has been a strong partner for western states and for Alaska, in particular," Senate Energy and Natural Resources Chairwoman Lisa Murkowski (R-Alaska) said in a statement. "After years of frustration with the Department, he came in and took a very different approach — he listened to us, built a great team, and worked with us to advance our priorities," added Murkowski, who also heads the Interior, Environment and Related Agencies Appropriations Subcommittee. 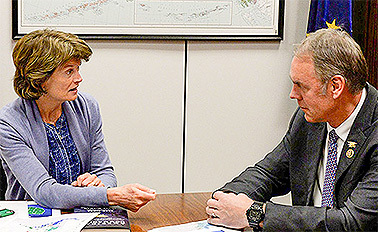 Both Murkowski and Alaska Sen. Dan Sullivan (R) pointed to the land exchange agreement Zinke executed to build a nearly 12-mile-long gravel road to King Cove, Alaska, as well as opening the Arctic National Wildlife Refuge coastal plain, known as the 1002 Area, to exploration. "Over the past two years, Alaska has had no better friend than Ryan Zinke. He joins the ranks of Gov. Wally Hickel as one of the great secretaries of Interior," Sullivan said, referring to the former Alaska governor who also served as Interior secretary to President Nixon. House Natural Resources Chairman Rob Bishop (R-Utah), who worked with the Trump administration to reverse the national monument status of nearly 2 million acres of public lands in Utah, likewise praised Zinke. In particular, Bishop lauded Zinke's proposed overhaul of Interior's structure, including the establishment of 12 new regions by July (E&E News PM, Nov. 1). "In the world of Washington politics, Zinke was an anomaly. He had a vision of a better future — an efficient department; a park system without a backlog; a staff who listened," Bishop said. "Where others dithered he got stuff done. We owe him a debt of gratitude." Democrats and environmental groups that were once willing to give Zinke a chance as a conservationist in the mold of Theodore Roosevelt soured on him long ago. They despised his action to shrink national monuments, his moves to expand energy production and his desire to please the president. The Senate confirmed Zinke 68-31. Sen. Ron Wyden (D-Ore.), one of the yes votes, later told the secretary during a hearing that it was one of his greatest regrets in public life. House Minority Leader Nancy Pelosi (D-Calif.), who is expected to be speaker in January, suggested that Zinke stepped down in part to avoid greater scrutiny from a Democratic-controlled chamber. "Secretary Zinke has been a shameless handmaiden for the special interests. His staggering ethical abuses have delivered a serious and lasting blow to America's public lands, environment, clean air and clean water," Pelosi said in a statement. She added: "The American people have demanded a new dawn of transparency, accountability and openness in government. When Democrats take the gavel in January, we will clean up corruption to make Washington work for the people." Zinke has decried the investigations against him — which include an Office of Government Ethics inquiry regarding a social media post featuring his Make America Great Again socks and an unspecified case referred by the Interior inspector general's office to the Justice Department — as politically motivated (Greenwire, Oct. 31). But incoming House Natural Resources Chairman Raúl Grijalva (D-Ariz.) — whose sparring with Zinke drew national attention last month when the Interior secretary attacked him as a drunkard on Twitter — offered a more tempered response. "This is no kind of victory, but I'm hopeful that it is a genuine turning of the page," said Grijalva, who brushed off Zinke's disparaging remarks earlier this month about his known predilection for spending time at the Capitol Hill bar the Tune Inn (E&E News PM, Dec. 11). He added: "Secretary Zinke's successor has a chance to move on from an unfortunate Trump administration record of environmental mismanagement and decline. A well-managed Interior Department — one that puts the public good ahead of fossil fuel and mining industry demands — can be a boon to the entire country." Names to replace Zinke have long been floating. Some observers pointed to Rep. Cathy McMorris Rodgers (R-Wash.), but a well-placed Hill source said she's not interested. Nevada Republican Sen. Dean Heller, who lost re-election, has also surfaced as a possibility. Trump could go with Bernhardt just as he tapped EPA deputy Andrew Wheeler to fill in for departing Administrator Scott Pruitt. Bernhardt, despite environmentalist concerns, passed the Senate last July on a near-party-line 53-43 vote. Voting yes were Democratic Sens. Michael Bennet of Colorado, Joe Donnelly of Indiana, Heidi Heitkamp of North Dakota and Joe Manchin of West Virginia. Independent Sen. Angus King of Maine did so, too. Heitkamp and Donnelly lost their battles for re-election to Republicans who will likely approve of whoever the president picks. Manchin, who will become Energy and Natural Resources ranking member and will help lead the hearings on Zinke's replacement, will likely have to balance his desire for bipartisanship and comity with his party's anger at administration policies. The White House schedule has the president meeting with Zinke today. It does not say what they'll discuss. Reporters George Cahlink and Manuel Quiñones contributed.